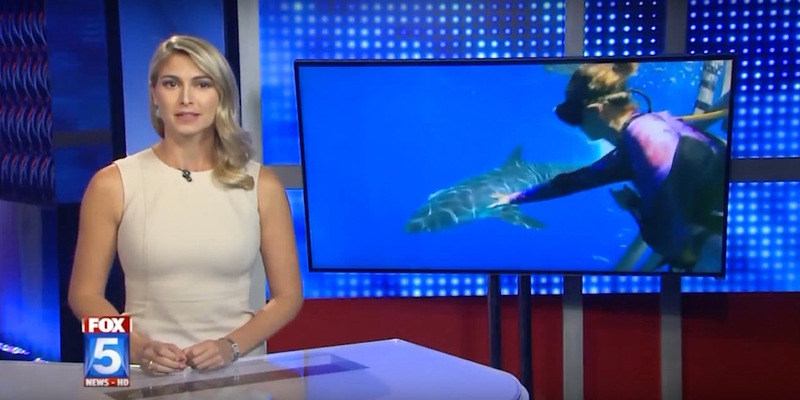 During September of our 2017 Guadalupe shark season we hosted Tabitha Lipkin from San Diego Fox 5 news. She wanted to capture the beauty of the Great White shark, showcase our exclusive expeditions and at the same time relay a conservation message to the public on just how important these animals are to the balance of our oceans. Tabitha had dived with many species of shark prior the this trip but never before had she been cage diving with Great white sharks. Full of enthusiasm and passion for wildlife she was the perfect host to showcase our trips and the amazing wildlife. The trip could not have been better for her and Travis (her cameraman) who captured some fabulous footage making a great two piece segment for Fox 5 news. September typically sees great weather and once again it didn’t let us down. In fact, it was sweltering during our time at sea. Its during conditions like this that just reminds us all again how special and unique a place Guadalupe is to dive with Great Whites.…in the warmth! On top of the stunning weather, the sharks really came out to play. We saw over 20 animals during the 3 days at the island including some very active “players” on the baits! When Tabitha was in the cage, sharks where coming close enough to be touched and the action was incredibly consistent. The size of the sharks, the clarity of the water and the closeness the animals where coming to the cage was a dream for cameraman Travis who was getting all the shots he needed and more! When Tabitha was out of the cage, the action from top side was just as good with sharks lunging on the surface baits over and over. Both Jimi and Ryan of the SDX crew where interviewed for the piece. Giving the viewers a run down of what can be expected on the trips. They also covered how important these trips are for eco tourism, the protection of the Great white shark and the ongoing efforts to help keep the Island controlled. Overall it was a huge success and we waited eagerly to see the final piece once aired. In November the two piece segment was aired on Fox 5 news San Diego and was a great success. The footage was brilliant, the interviews where insightful and Tabitha and her team really put together a short, exciting and educational message. It was a pleasure having both Tabitha and Travis onboard what turned out to be a exceptional trip so early into our season. As well as making a great film, we all had so much fun diving and filming on the water and as ever, getting up so close to one of the most inspiring and fascinating wild animals on the planet…..the ever popular and star of the show – The Great White shark.